Baptism Renewal – TBD: During our worship service, we will highlight Jesus’ baptism (which inaugurated his public ministry) and will invite all of us to renew our baptisms. If you have not been baptized, and would like to be, this is a wonderful opportunity to receive that sacrament. 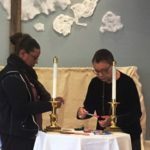 Service of Remembrance and Thanksgiving – November 10, 2019: A special worship service in which we remember your loved ones in a special way with a theme, a visual representation and an invitation to bring forward names of those who you wish to celebrate. Prayers of thanksgiving to God are offered. Celebrate Rev. 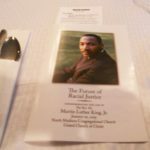 Dr. Martin Luther King, Jr. – January 20, 2019: We observed the life and teaching of Dr. King during worship, followed by a brunch with guest speaker, Maurice Tiner. Maurice, a graduate Student at the Yale Divinity School who spoke on “The Future of Racial Justice, followed by a hosting a lively Q&A.